I discovered this recipe a long time ago, and it's been an all time favorite for my friends and family. The preparation is simple, and the long cooking time softens the meat until it literally melts in your mouth. And while the preparation takes a while, you don't really need to stay next to the oven the whole time (in the past, I even headed to the beach for some volleyball while the dish was cooking in the oven). - Start by picking a cooking tray that's at least three inches deep. 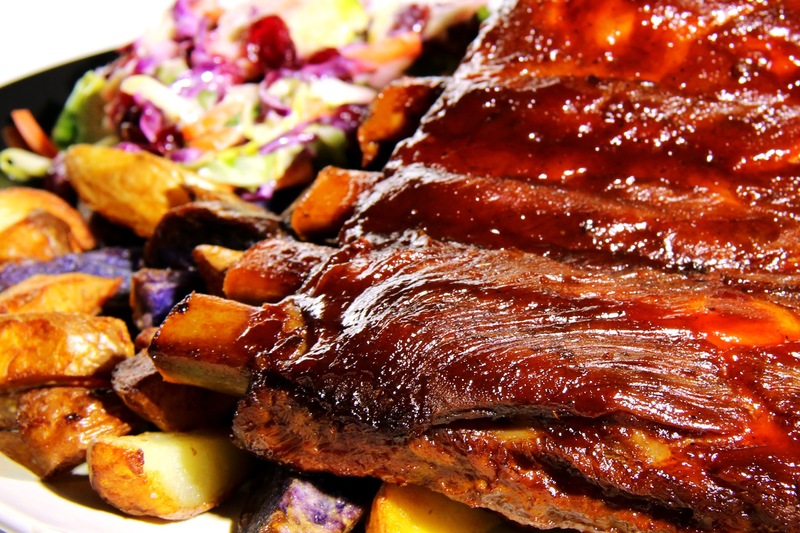 We want the ribs to cook in liquid, such that they are juicy and fall off the bone when done. Use about half a cup of cooking oil, and add beer until we have about half an inch of liquid (I use either an amber ale or a pale lager, though I don't think this will influence the flavor too much). A beer will likely be enough, depending on the shape of the tray you're using. - Clean the ribs and place them in the tray such that the presentation side faces down. We'll be cooking the meat for a while, and only flip it over towards the end such as to finalize the color and the texture for the presentation. - Put the tray in a preheated oven, and do not cover. Cook at 425F for an hour. Lower the heat to 225F, and cook for another four hours. Next, we first coat the top side with barbecue sauce, and continue cooking for another 30 minutes. Gently flip the ribs such that the presentation side is now facing up; coat with a generous layer of barbecue sauce, and cook for another 30 minutes. - Remove from the oven, and serve before it gets cold. - The ribs should have a beautiful red color when done. We'll add more colors in the side dishes that accompany it. - Coleslaw is my favorite side dish for this recipe; it looks great when you mix both red and green cabbage to prepare it. - Fries can be another great side dish, particularly when made out of colorful heirloom potatoes. - If you want to try a Romanian twist to the recipe, a good serving of colorful mujdei can go a long way in both taste and color. - Last, and certainly not least, you may want to enjoy the recipe with a cold beer. I usually do.